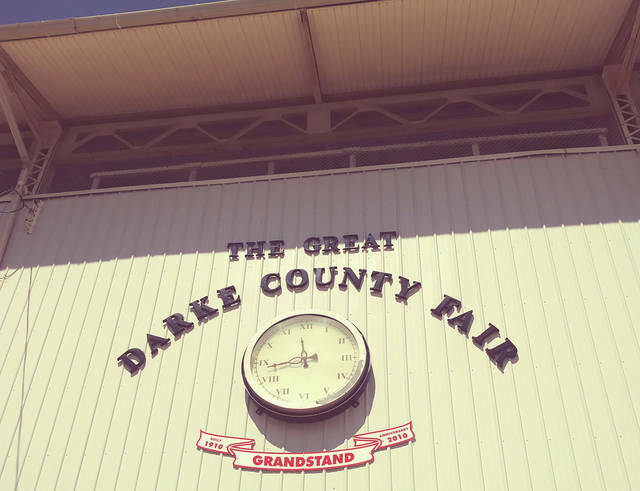 The Darke County Fair Board received updates on fundraising efforts for construction of new barn facilities and approved a rescue services contract with Greenville-based Spirit Medical Transport at its monthly meeting Wednesday night. GREENVILLE — The Darke County Fair Board received updates on fundraising efforts for construction of new barn facilities and approved a rescue services contract with Greenville-based Spirit Medical Transport at its monthly meeting Wednesday night. The board went into executive session for approximately half an hour early in Wednesday’s meeting to discuss the rescue services contract. Following the session, board members voted to approve the contract with Spirit Medical. Matt Hughes of Cincinnati-based nonprofit consulting firm Fair Funding LLC, meanwhile, told the board and assembled guests that the fair has raised $1.5 million of the projected $2.5 million needed to construct three new barns for the junior fair’s swine, goat and dog exhibitors. This figure includes a $500,000 donation from Minnesota-based Cargill, Inc., as well as approximately $800,000 in insurance funds and an additional $200,000 raised by Hughes himself. Hughes revealed information on a number of recent gifts, including a $50,000 donation from Darke County residents Terry and Becky Hartnagle that will fund construction of a show arena in the new goat barn; a $50,000 gift from Second National Bank to sponsor the swine barn show arena and $10,000 donations from Wayne Hospital in Greenville and Graves-Fearon Insurance Agency in Troy. Hughes said he has pending fundraising requests out to more than 35 companies and organizations. Hughes congratulated Darke County residents on their willingness to give. Friends of the Senior Fair Board representative Rachel Fearon also addressed the board about its upcoming fundraising kickoff dinner. The event will take place at 7 p.m. April 12 in the Youth Building at the Darke County Fairgrounds and will feature locally-prepared food and guest speakers, including Dave Knapp, owner of Dave Knapp Ford in Greenville, who was appointed chairman of the board’s fundraising campaign in February. Other donors will offer testimonials during the event while evangelist, farmer and inspirational speaker Ray Perryman, who conducted services at the 2018 fair, will produce an exclusive video that will debut as part of the night’s festivities. Fair Board member Thomas Shaw will emcee the event. Fearon stressed that all donation amounts are welcome and that gifts can be broken up over five years. The fair board voted in October 2018 to hire Hughes’ company to conduct a feasibility study to determine whether enough support exists in the community to raise the funds needed for construction of the new barns. These plans were called into question, however, following the fire Oct. 25 that destroyed the existing swine barn. Construction on the new swine facility by Minster-based H.A. Dorsten, Inc. is expected to begin April 15. This entry was tagged Darke County Fair, Darke County Fair Board, Darke County Fairgrounds, Fair, fair board, Fairgrounds. Bookmark the permalink.